This beach ranks #2 of the "Best beaches in Thailand"
Soneva Kiri is a great hotel, but very expensive. And besides there is no more official transfer the south beach, as it was before. If you are not a member of the Rockefeller family, feel free to choose any ordinary hotel in the north-west of the island. Keep in mind that the location of some hotels marked in a wrong way on maps. So the hotel which seems to be the closest to the beach, in reality may appear be on the other side of the island. Captain Hook Resort is located just a bit to the south from out Beach. Unfortunately, it is isolated from the island's road network, so kayak is the only way to get to the former South Beach of Soneva Kiri. Fly to Bangkok international airport (BKK). Next get to Trat - by the taxi, or by bus, or by plane. Next take a ferry to the Koh-Kut island. There are direct ferry services from Trat, as well as connecting routes via Ko-Chang and/or Koh-Mak. Next hire a taxi ot take a tuk-tuk. It is best to get to the Beach by bike or by taxi. Use GPS-navigator not to be confused in numerous turns on the way to the beach. 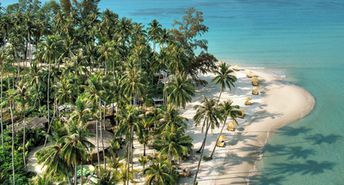 The best time for a beach holiday in the island of Koh Kood is a dry season from November to March.